President Ashraf Ghani met with US General Austin Scott Miller just hours after he took command of US Forces-Afghanistan and of Operation Resolute Support on Sunday at a ceremony in Kabul, Ghani’s office said in a statement. 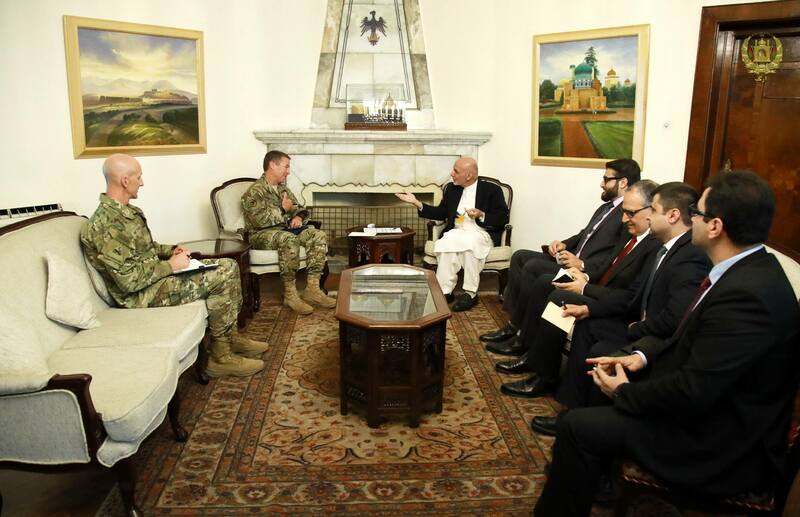 At the meeting, Ghani “thanked Gen Miller for taking the responsibility and wish him success,” the statement read adding that Ghani and Miller both discussed priorities of the Afghan security and defence forces and also the US strategy for South Asia and Afghanistan. Miller takes over from Gen John Nicholson, who led the NATO mission for over two years. A change of command ceremony was held in Kabul on Sunday and attended by high-ranking officials from the Afghan government, including Interior Minister Wais Ahmad Barmak and National Security Adviser Hamdullah Mohib. Other VIP guests including the head of UNAMA, Tadamichi Yamamoto, along with ambassadors and other dignitaries. Addressing guests, Miller said NATO partners and Afghan partners have sacrificed much over the past 17 years – he commended all NATO commanders for the work they have done. Miller said that the world is committed that Afghanistan will never return to being a safe haven for terrorists. “The world recognizes Afghanistan cannot be a safe haven for terrorism. The world recognizes we cannot fail. I know this has been a long fight and it has been generation; for us, for the Afghan people, I understand the reason we are fighting and I know why we are here and I know terrorists seeks safe haven to export more murder, attack the innocent and threaten everybody’s way of life,” said Miller. According to Miller, there are still groups in Afghanistan who want to export only murder and to inspire attacks to threaten the entire world. He said that the US and the international community will help Afghanistan to maintain pressure on these groups to ensure that they never use Afghanistan as sanctuary for their activities. “There are groups in Afghanistan who want nothing more than to harm others. These groups thrive in ungoverned spaces, General Nicholson mentioned, the war spilled over to the rest of the world, they raise money, they recruit, they plan, they inspire attacks, we must maintain pressure on them. We must ensure terrorists can never use Afghanistan as a safe haven to threaten the world,” added Miller. However, he said sustainable solutions need to be found in Afghanistan. According to the president’s office the two discussed issues around the security forces and the US’s strategy for South Asia.